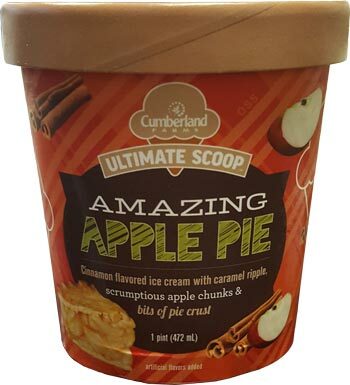 When I picked up Cumberland Farms latest Ultimate scoop flavor, I used their 2 for $7 promotion to pick up a second pint as well. School time means fall time, so I think something seasonal is in order. The puddle of swirl calls my name and I dig right in. The swirl is light (thin) but flavorful. There's also lots of flavor coming from the base. Apples, caramel and cinnamon all come into play here. The bad news is that the texture of the ice cream is still terrible. It's easy to scoop but you can taste the water in it. It's not that it even tastes freezer burned, it just tastes like ice. You desperately need the pie crust bits to offset that shaved ice feel. I really do like how much flavor is coming from this pint, despite it feeling like I'm eating Italian ice. This is just weird to me because it has the makings of a great ice cream. It reminds me of B&J American Apple Pie. 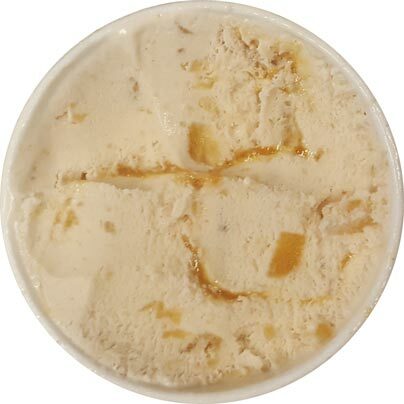 I just reread that review and I mentioned wishing there was more swirl so that there would be more of a cinnamon kick. Well, there's plenty of sweet cinnamon in every bite here. The flavor is dialed in perfectly, I don't think I would change it at all. The rectangle is one of many apple bits. Despite the substandard texture, I have enjoyed my afternoon snack. Since there are so many great chilled apple products in the world (apple juice, apple cider, apple pie, etc), you can partially forgive the texture just to get at that sweet, sweet chilled apple taste. Fix the texture and I'd have no problem keeping this handy in my freezer. I'm always looking for that next great cinnamon flavor for my breakfast sundaes and this would totally work. On Second Scoop: Curse you texture for messing with such an excellent flavor. Sure, I still polished this pint off with ease, but I want perfection! To put it another way, a "premium" ice cream that has 250 calories per serving like this one does should then also furnish me with 4, preferably 5, grams of protein as well. Not here. We only get 2 grams. That tells me they cheaped out on the good milk and cream. I can't quantify the problem any better than that. If it was two for five bucks, I'd say whatever, but two for seven, that is a tougher sell in today's market (Haagen-Dazs has been on sale at 2 for 5 the last few weeks). Anyway, I do still dig all the caramel and cinnamon flavor here. On occasion you might get an extra strong note of apple in a weird way, but still a really nice flavor overall. Try this if it's got your interest, but keep my thoughts in mind. 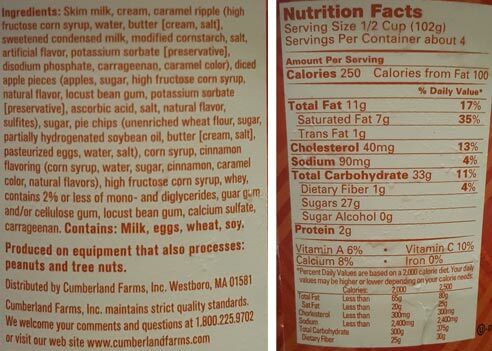 I probably won't be buying any more Cumberland Farms ice cream for awhile. Back in the days this was One of my favorite b&j here in europe. Also tried Häagen Dazs Apple Crumble during vacation in 2011. This flavor was awesome!